From Venetian cichetti to Mediterranean meze, Japanese izakaya to Spanish, French and American “tapas,” serving small plates of delectable tid-bits has taken the nation by storm. Get in on this latest foodie trend by hosting a wedding reception that forgoes the traditional dinner in favor of a few hours of heavy hors d’oeuvres. Whether you opt to have all the trays paraded around the room or combined with stations, your guests will love the chance to DIY their own tasting menu. 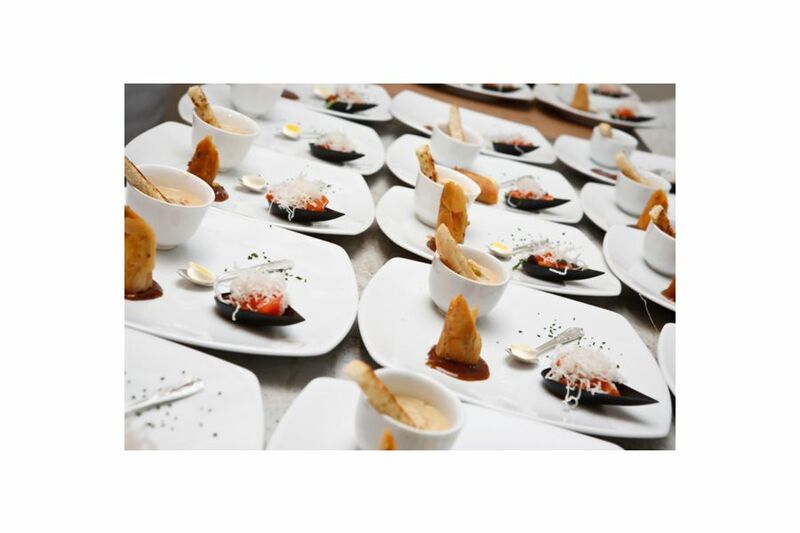 But first you need to determine if serving a cascade of canapés is the right fit for your fête. Heavy hors d’oeuvres receptions do tend to be less formal, says Michele Stump, managing partner of Boston-based East Meets West Catering. For example, instead of assigned seating at dining tables, there would likely be a variety of tall and short cocktail tables and low chairs, couches or benches scattered around the room. As a result, guests are free to eat on their own timeline and typically move around and mingle more. As for the edibles themselves, be sure to provide both hot and cold items in a variety of colors and shapes that include a few protein choices as well as multiple options for vegetarians, says Bridget Pelster, a sales & catering manager for the St. Louis-based Butler’s Pantry. For couples on tight budgets, she recommends taking a lighter approach, such as offering different kinds of petite gourmet sandwiches and fresh fruit kebobs, in addition to a handful of hot appetizers. Just be sure you notify your guests on your wedding website or by word-of-mouth (not on the invitation) if the dinner won’t be substantial. However, if you still wish to provide a hearty meal, Pelster suggests mixing a DIY salad, ceviche, antipasto, mashed potato, pizza, pasta and/or risotto station in with plates of elegant nibbles like tuna Niçoise on potato wafers, mini wild mushroom soufflés and seared Asian potstickers. In Boston, Stump’s clients are big fans of fun American favorites, like stations for sliders and mini-hot dogs, or passed hors d’oeuvres that present fun twists on regional favorites, such as mini-lobster rolls or soup spoons of deconstructed clam chowder. Carry that style into dessert with a cappuccino station and trays of cupcakes and ice cream cones. The options are as boundless as your imagination – and your budget. “In general, you should plan for five to 10 pieces per person for the first two hours, and five pieces per person for each additional hour,” says Stump. But pricing will vary widely depending on your venue and region, as well as what you serve and for how long. Either way, in a world of foodies, vegans and gluten intolerants, serving a wide variety of small plates will up your chances that every guest will go home happy and well-fed.